The only thing missing were gold coins. 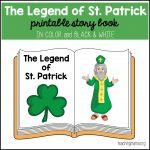 I would’ve loved for the boys to try to find gold coins in the rice mixture, but I went to four stores and couldn’t find any! Does anyone know where to get gold coins?? Exploring and beginning to make a mess! 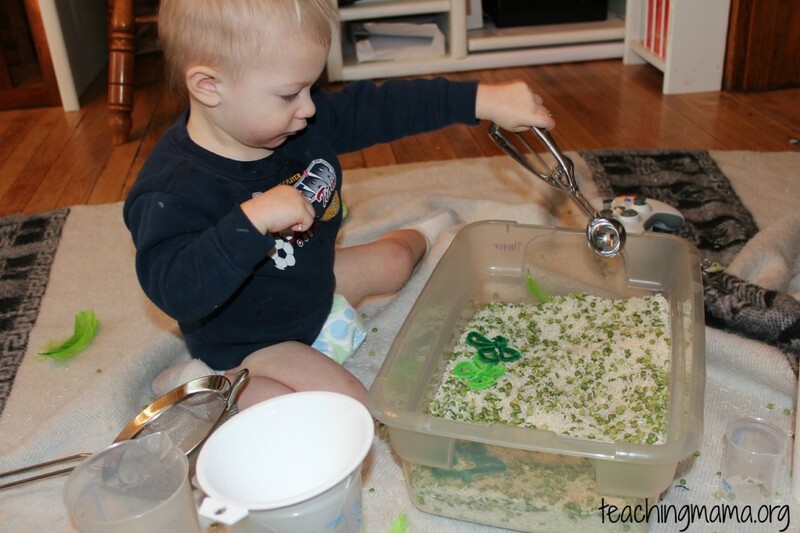 That’s what I love about sensory play. 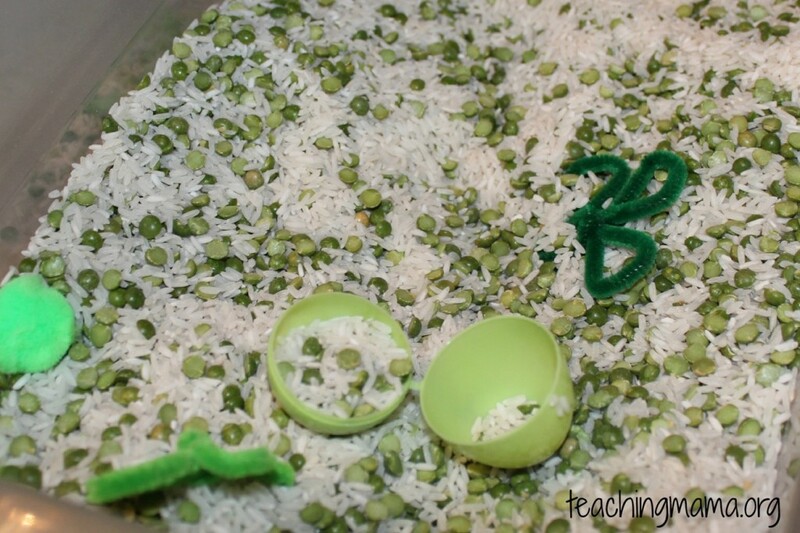 They can be messy, but so much learning is going on! 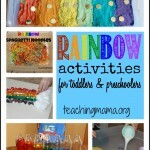 Children need lots of free, unstructured play time. 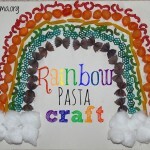 Allowing them to discover and be creative helps them learn and grow! 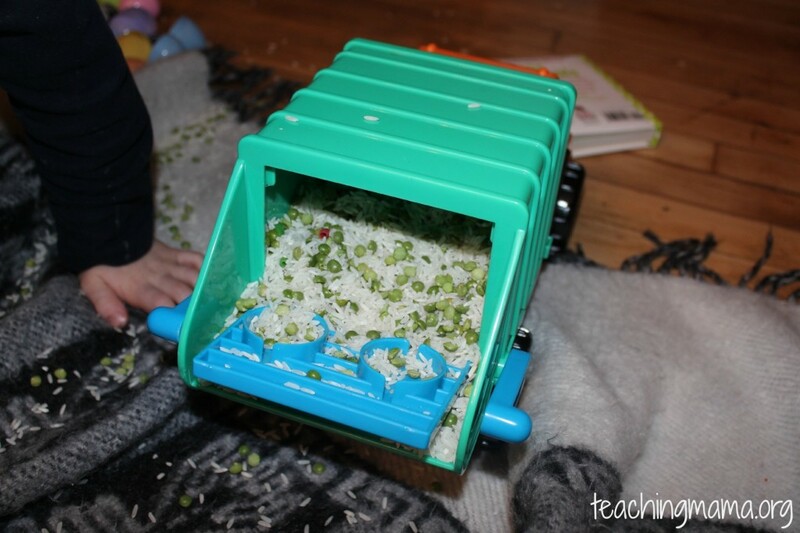 I know it may seem messy, but trust me–this is important for their development! How cute is he?! 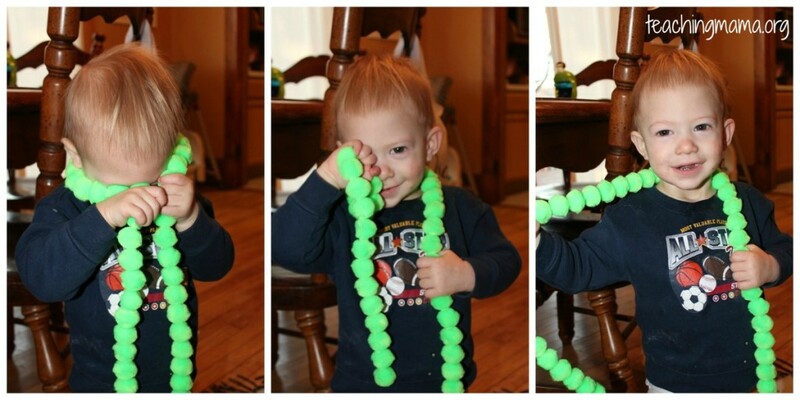 Playing peek-a-boo with the pom pom string! He sure loved the softness of the pom poms. 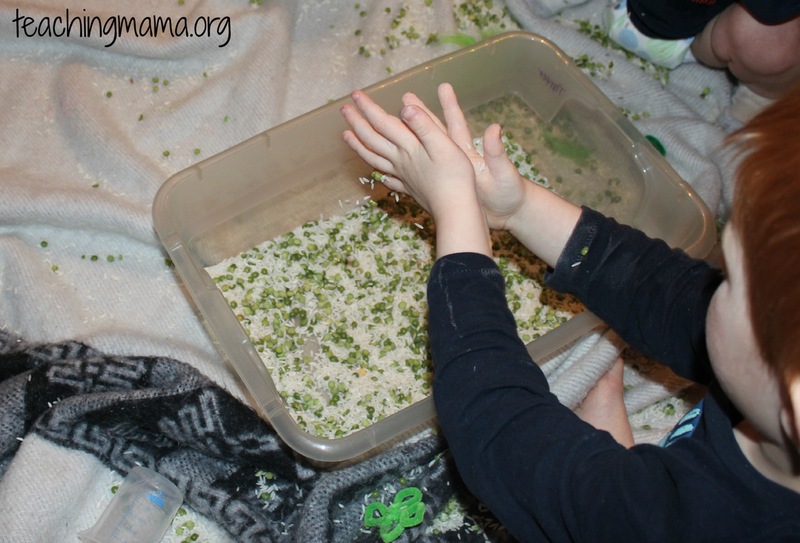 Troy decided to play with the sensory tub differently. 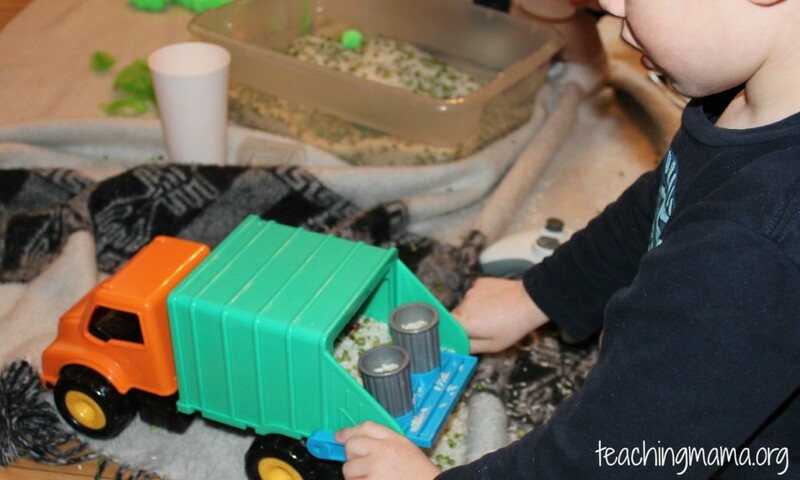 He took his new dump truck and filled it with the mixture. Instead of scooping, he had an idea to fill plastic eggs up and then dump the contents into the truck. Love his creative mind! 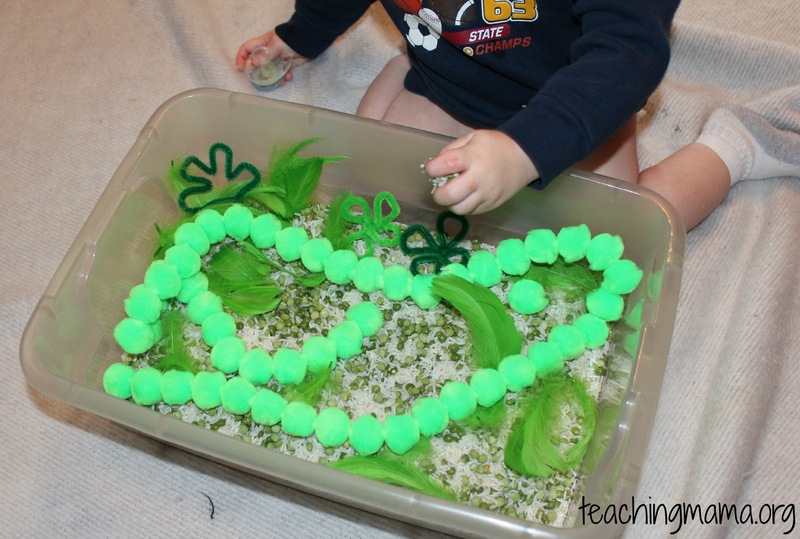 We had a blast discovering and playing with this sensory tub. The green colors reminds me that fresh green grass and plants of spring are just around the corner. Hoping the rest of winter goes by quickly! Have a great day!! If you have a Party City the should have gold coins. Good idea! Yes, there is one around here. Maybe I’ll have to check it out. Thanks for the idea! Oriental Trading has gold coins. Oh yes, I forgot about Oriental Trading! Wow, that’s a great idea about the sheet. We usually put a blanket down or go outside, but I King-sized sheet would work really well. Thanks so much for the idea! Your sensory tub looks like a lot of fun. I love how your son put the rice mixture in his truck! 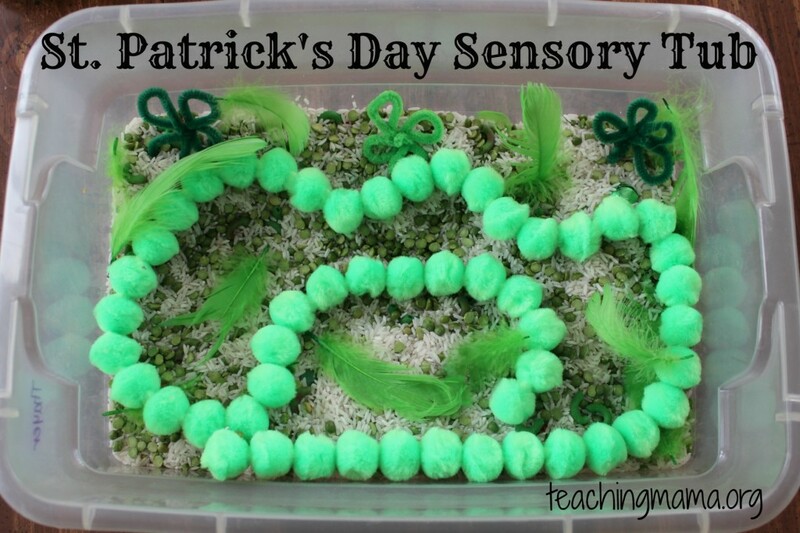 I love your St. Patrick’s Day sensory tub … so many great learning activities! 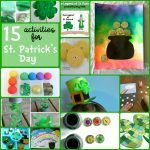 I pinned your post to my Kids’ St. Patrick’s Day Sensory Activities Pinterest Board. 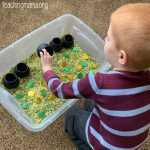 Great sensory tub. 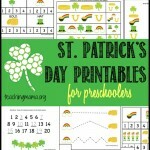 I followed your link from Preschool and Kindergarten Corner. I found my gold coins at Dollar Tree! Amazon, they have plastic gold coins! !